Are you curious about what new products other retailers and consumers were looking at on TDmonthly Magazine in 2008? Following is a list of the 30 most-viewed 2008 products. * Do you have them in your store? *Some manufacturers received high views of multiple products, owing to their ToyShow Preview or other ToyDirectory service; only their top-rated product is listed here. David and Goliath Read-Along Storybook with included CD-ROM by PC Treasures, Inc.
Other products from PC Treasures, Inc.
Brave young David faces the fiercest warrior of his time, the wicked giant Goliath, armed with a simple slingshot and his unyielding faith in God. Squirmles The Magical Pet by Nowstalgic Toys, Inc.
Other products from Nowstalgic Toys, Inc.
Squirmles are incredible toy puppets who'll wiggle, jump, and squirm their way into everyone's hearts. All Squirmles Pets are packed in their own colorful sealed packages and come with their own storage/carrying cases for when not in use. Packaged, Tied, and Ready to Play. — Marc Holcomb, owner of Toys & Co. in Greensboro, N.C., told TDmonthly in a September 2011 survey that they sell about 120 Squirmles each month. They have a display that features a video of the product. Vanange dolls are beautiful and wholesome seven-year old girls who come from different parts of the world. They are learning about each other and they are developing very special friendships with one another from across the globe. They are extremely courageous and loving little girls who are ready to do what they can for other children in need. Their books are educational, inspirational, motivational and empowering! HEXBUG Micro Robotic Creature by INNOVATION FIRST LABS, INC. The micro-robotic HEXBUG is a tiny, obedient insect that features bump-sensor feelers that help it avoid objects in its path. It responds to clapping or other loud noise by backing up or changing direction. The HEXBUG is small enough to fit in the hand and comes in five different body types and colors including pink, blue, green, yellow and orange. Awards: TDmonthly Innovations 2008. — "Everyone wants one, from adults to kids," Charles Bonner, owner of Heights Toy Center in Little Rock, Ark., told TDmonthly of this best seller in April 2009. "I sell 200 to 250 a month." 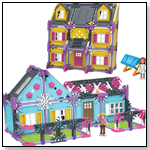 Three of 44 retailers tagged Hexbugs as an overall best seller in late fall 2009. — During a September 2010 survey, two of 44 retailers listed Hexbugs as their top-seller for tweens. Land, sea, and sky - we are all a part of our great, beautiful world. The breathtaking horses of Bella Sara™ Native Lights have arrived, reminding us of our connection to nature and to those who live in harmony with it. Along with the special animal friends who teach them the wisdom of land, sea, and sky, these magical new horses will delight and inspire you - much like the beauty of nature itself. New with Native Lights, each card and corresponding virtual horse also feature an animal companion - a guide and friend linked to the spirit of nature and to the horse - that will join the horse in their online stables and users' cottages. Bella Sara Native Lights includes 72 new cards: 45 regular horse cards (each with a distinctive animal companion), 10 rare energy cards that can be activated for decorating users online-cottages (new Native American digital items include a dreamcatcher, a headdress, moccasins and other artifacts) and 17 extra-rare "shiny" horse cards. Each Bella Sara foil flow-wrapped card pack (MSRP $2.99) contains seven random horse and/or energy cards that can be collected and traded or used to play Bella Sara card games. Launch Date: March 2008. The 1957 Chevrolet Bel Air is considered by many to be one of the most Beautiful cars ever built. With it's sleek lines, in your face grille and with first of its kind tail-fins. It's been stealing hearts ever since the first one Rolled off the assembly line. A game of strategy and skill for all players, ages 8 to 88, and its fun for the entire family! You’re the coach, quarterback and the team owner. Complete with everything you need to play the game. Rose Bowl teams in their official hand-painted uniforms are included. Yuletool is a handy gadget for parents. It is a wire and tie cutter for those very annoying wires that tie the toys into the display packages. Just reach behind the toy and snip the wires and ties and the toy is free. Our Wild Safari Jungle lioness with cub is authentically sculpted, hand painted and phthalate free. Developed with leading animal experts, these replicas are just like the real thing, only smaller. Safari's jungle series has more than 80 realistic replicas. All animals include five-language educational information to educate children about our planet¹s endangered wild kingdom. Size: 6" L x 3" H.
Tatiri's wooden Guitar comes in 2 nice colors...It's a nice piece to have for beginners to learn to appreciate music! Based on the photo by Anne Geddes of the three real babies seated in decorated tin cans with their heads popping out dressed in hats decoratively detailed with pansies, Laura Tuzio-Ross has once again, under Anne's direction, created three incredible new sculpts, Eliza, Chloe, and Grace. Eliza is dressed in a French blue romper with a petaled sleeve detailing and pretty embroidered pansies on her bodice. Each baby in the pansy group has a different position of the pansies on its bodice. She also wears a diaper and an adorable soft hat covered with over 52 individual pansies to duplicate the original look from the Anne Geddes image. A papier-mâché container decorated with the original design is applied in the same artistic manner as the original tins. The container is lined in brown felt to protect the body as you place her in the container. Comes with the Anne Geddes Logo packaging with a hand-numbered certificate and hang tag. The decal is sewn into the cloth body with the edition number on it. Tonka Mighty Motorized Street Sweeper by FUNRISE INC.
Other products from FUNRISE INC. The hands-on, free-wheeling vehicle features lights and sounds, motorized, sweeping brushes, a motorized waste conveyor belt and a scissor-lifting waste disposal. Three AA batteries are included. Launch date: Fall 2008. Conservation Critters™ by WILDLIFE ARTISTS, INC.
Other products from WILDLIFE ARTISTS, INC.
A brand new line called CONSERVATION CRITTERS™ (avg size 9”, MSRP $4.99) is being debuted for 2008. Cats, Primates, Bears, Wolves, Frogs, Otters, Rays, Gators, Sealife in super soft material all with a floppy, beany feel to make these Critters all the more playable and loveable. The Snowskates that "actually" skate. Easy to ride, just like a skateboard. Solid construction with stainless steel hardware, for durability and has adjustable ski suspension to customize the feel. Don't get caught on the slopes with out it. This versatile little piano grows with the child. The main unit, decorated with a whimsical animal's head, is perfect for toddlers because it sits safely and squarely on the floor within easy reach of little hands. Later on, the sides with the animal's body can be attached, conveniently raising the piano to a comfortable height for an older child seated at the bench. Included is Schoenhut's® Learning System, with a removable color-coordinated strip that fits behind the keys to guide small fingers from chord to chord. The accompanying songbook contains a collection of familiar tunes. 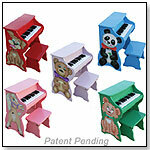 Schoenhut toy pianos are famous for their lovely chime-like tones. The keys are spaced correctly for a full-sized piano, which teaches proper finger placement and affords an easy transition to a large piano.The piano is 19-3/4" H x 16" W x 10-3/4" D and the bench measures 8" H x 8" D x 11" W. This product weighs 17 lbs. Launch date: February 2008. T-Brace Game Stand by BOLABALL INC.
Other products from BOLABALL INC. Introducing the next innovation in Bolaball. We've taken into consideration that our city dwelling friends wanna play too! Great for setting up in the driveway, patio or on really hard ground! Product Description: T-Braces for the game of Bolaball to be attached to the bottom of the vertical post to convert it to a freestanding game. 2 T-Braces per bag. KYDZ Building Table by JONTI-CRAFT INC.
Table size is large enough to accommodate several children but small enough to fit in activity area. One base plate is permanently mounted to tabletop, colors will vary. 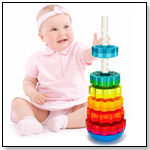 Choose either Duplo® or Lego® compatible base plate. Store bricks in four optional tubs. 25" wide x 28" long x 19" high. Features KYDZSafe® edges, KYDZTuff® finish and KYDZStrong® construction. Backed by a lifetime warranty. Made in the USA. A Photographer’s Dream! A Child’s Delight! Stretch velvet bodice and yards of tulle feature sweet velvet pansies. This enchanting outfit has matching streamer headband with a hidden band inside for easy wear. Add matching velvet wings for the total look. The outfit is washable and available in sizes for ages 18 months to 10 years. Destruct 3© by UNCLE SKUNKLE TOYS, INC.
i-Fly Hawk by INTERACTIVE TOY CONCEPTS LTD.
Other products from INTERACTIVE TOY CONCEPTS LTD. The i-Fly Hawk continues in the iFly series. Based off of the similiarities of the i-Fly Vamp, this flier has a bird theme design with feather illustrations on the wings. Kids can "break-the-ice" with this beautiful arctic play set, the first of Top Shelf Holdings’ Natural Habitat Series. The set includes two flexible wooden Inuit figures, a papoose, an igloo, ice slides, an ice-fishing hole and six realistic polar animals. "Long have we lamented, in the educational toy business, playsets and other products constantly pairing the dapper penguin family with the friendly neighborhood polar bear. This collection features fauna from both the arctic and antarctic regions of the globe, as well as informational materials about the animals themselves," said TDmonthly reporter and toy-store buyer Marie Raven at Toy Fair 2008. Launch date: June 15, 2008. Lemon Loves Lime Apparel by LEMON LOVES LIME INC.
Other products from LEMON LOVES LIME INC.
Each piece from Lemon Loves Lime collection is wonderfully unique and resembles cherished memories of our daughters' childhood that we hold dear in our hearts; their exuberant smiles and laughs of happiness, their tears of sadness and fright, their innocent curiosity and wonder of the world before them, as well as their playful mischief. Photographic Images from BBC Landmark TV series. Each image telling a story of the most spectacular natural events and animals on Earth piece by piece. Friend Trading Cards by CHATTERCHIX INC.
Other products from CHATTERCHIX INC.
Every ChatterChik™ represents a different U.S. state and comes to life through her distinctive bio, appearance, personality and lifestyle. Girls can collect all 50 cards in the series and even trade-out with their friends. Eco Dolls are 11” fashion dolls constructed with 80-percent cotton and natural fibers and minimal plastic on the head and hands. The dolls inspire play and support the innovative and curious nature of girls. Tanya encourages young girls’ interest in science and environmental responsibility through a beautifully illustrated storybook, a learning adventure about how trees help make air quality better. “The ‘eco’ focus of the Eco Dolls truly sets this product apart — from the environmentally friendly construction to the dolls’ environmental learning adventures,” Kelli Matthews of E-Innovative Ideas told TDmonthly. Launch date: January 2008. The set is a modern day paper doll style activity where girls can dress their dogs again and again with their own one-of-a-kind creations. The kit includes five “paper doll” dogs, clothing patterns, fabric, glitter glue, sequins and more. A portion of the proceeds from sales of their two new dog design kits to SPCA International (Society for Prevention of Cruelty to Animals International). Launch date: May 2008. Ruin by BUFFALO GAMES INC. Ruin is a ruthless race for fortune and glory toward the center of an ancient Mayan ruin. Players move through and around an unpredictable and interchangeable game board. The distinctive 3-D game board allows you to change the path on every turn as game cards actually insert directly into the board. A perfect game for the entire family, this light-strategy game offers elements of skill, chance, luck and imaginative adventure. Launch date: April 1, 2008. — "I appreciated that this toy was linked to an ancient culture, opening the door for discussion and history exploration," said TDmonthly Roundtable reviewer Teresa Wilson, whose four children, along with other kid-reviewers, enjoyed the strategic options the game affords.